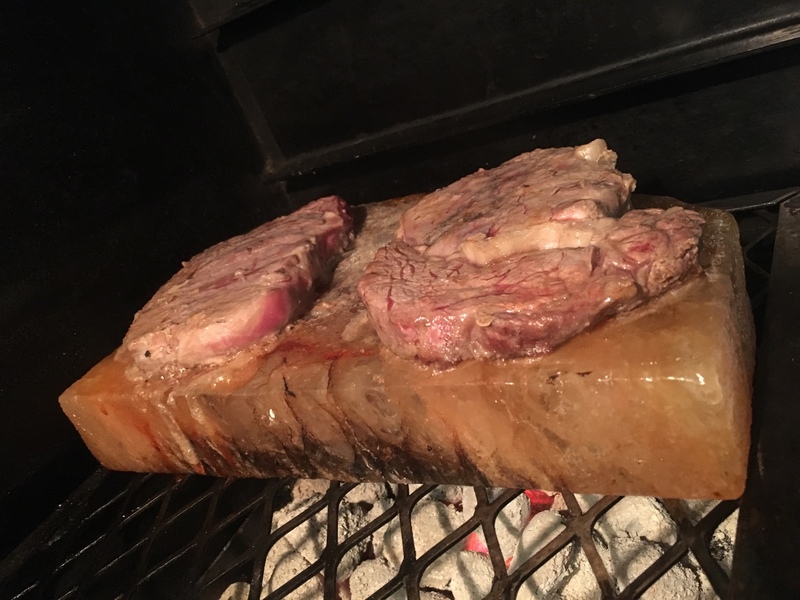 Can the salt block handle high heat? The steaks look like they're stewing rather than grilling. I like that salt block idea. I wonder how hot one could get the salt block before slapping on the steak. I must be honest, the fire salt block wasnt as hot as it should have been. I have had better results putting the salt block on a gas braai. The salt block can take as much heat as you can throw at it. The hotter the better. As you put the steak on it should immediately sear. Normally two to three minutes per side, the flavour it infuses into the steak is simply sublime. You can get the salt block very very hot. 260 to 280 degees celcius. It needs to be heated slowly though, so a large braai is preferrable. 25 minutes on low heat, then add coals to medium heat for another 25 minutes, then stoke & add coals for very hot heat for another 25 minutes. It's easier to heat it over a gas burner or even in the oven than on the braai. Works on the same principle as charcoal - hold your hand 2 to 3 centimetres above the block, if you need to move your hand within 5 seconds or less then it is ready! So around 260 degrees celcius. Cook steak the same way you would over coals. Remember to only use metal cutlery, never plastic as the plastic will melt into the salt block. Seared Asparagus is easy to cook on them, ditto for eggplant, as is whole fish or even fish fillets. Best to cook food that cooks quickly - the are perfect for searing & you can also use these blocks cold - perfect for Sashimi - it can be fun for the kids to watch the sashimi "cure" the longer it sits on the salt block! Watermelon & Feta salad with greens is also very nice - the slight tang from the saltiness adds an interesting twist. Use welding gloves. Oven gloves, even thick ones, heat up very quickly when handling the block. Where would one get such a block? Where were you when I bought? I shelled out R499 for the same thing! There's a shop on Belvedere road in Claremont that keeps them as well. It's between the pharmacy and the bottle store, near the choo choo park. I think he's Pakistani or Iranian not sure, very friendly bloke. The main product is Persian carpet but he also stocks all manner of Himalayan salt products including these for R200.00 each. Most Spar's that I have been into also sells them. Used mine on the gas stove and braai - Worked like a charm until it go too wet and dissolved. How did it get wet enough to dissolve?? Tell that to an 8 year old doing the dishes.